My books are renowned for the content of detail, particularly in relation to official records compiled during the Second World War. I will always be pleased to assist with enquiries from any individuals who have an interest in my books and aviation research. In addition I would like to provide the following information which may be of assistance to those who may wish to research their own family connections in WWII aviation. This venue will allow you to inspect and copy documentation from a wealth of avenues. The Squadron records in written or typed format identify the crews and individuals that flew on operational duties. Some records are more detailed than others but without doubt it will be possible to trace crews, aircraft and incidents of note by these records. Internet searches facilitate downloads of some records. The Air Historical Branch has been a long established department which originally had been entrusted with writing the Official History of British air operations in the First World War. 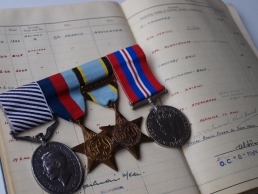 The branch now maintains and preserve the historical memory of the RAF and one particular avenue of material relate to individual aircraft lost or damaged records. This important area of information can be obtained by writing to. This CWGC internet site has a searchable database known as ‘The Debt of Honour Register’ which contains the names of 1.7 million casualties from both World Wars and the 23,000 cemeteries, memorials and other locations world-wide where they are commemorated. The register can also be searched for details of the 67,000 Commonwealth civilians who died as a result of enemy action in the Second World War. Since this sites availability on the internet it has continued to develop and now represents a most important avenue for research. In addition correspondence to them at the following address always provides excellent information. Royal Air Force personnel records are held at RAF Cranwell. The personnel records department will only divulge information to the person to whom it refers or, if he or she has died, to his or her immediate next of kin. Anyone else must obtain written permission from the person about whom they are enquiring, or from his or her next of kin. A charge will be made for any information they provide payable to ‘HMG Sub-Account 3627’. The only people exempt from charge are the person to whom the records refer to or their widow or widower. Confirmation of medals and decorations awarded can be provided by writing to the RAF Disclosure Section at RAF Cranwell. The vast majority of Second World War medals were issued unnamed and this factor occasionally causes’ problems with family history. The department is able to advise accordingly but you may experience a delay in receiving that information.